Wednesday, the 18th Instant—the three-hundredth anniversary of the Death of Luther, "the solitary Monk who shook the World," was to have been celebrated with great pomp in all the Lutheran churches of Prussia. We hope to be enabled to present to our readers some graphic record of this memorable solemnity. The last days of the fearless Reformer may be thus narrated. At the beginning of 1546, Luther repaired from Wlttenberg to Elsteben; where he preached four times, and also revised a plan of regulations concerning the ecclesiastical discipline of that little State. He had been, for some time, in a very precarious state of health: on the 17th of February, he felt very ill and weak, laid himself on a couch, spoke of his approaching death, for which he appeared quite prepared, and recommended his soul to Jesus. He grew worse in the evening. Count Albrect, of Mansfeld, and his Countess, and several medical men, attended him during his last hours. Every site associated with the personal or public history of Luther is regarded as hallowed ground; whilst, "the form of the monk of Wittenberg, emerging from the receding gloom of the middle ages, appears towering above the sovereigns and warriors, statesmen and divines, of the sixteenth century, who were his contemporaries, his antagonists, or his disciples." We have engraved two of these venerated localities—1. 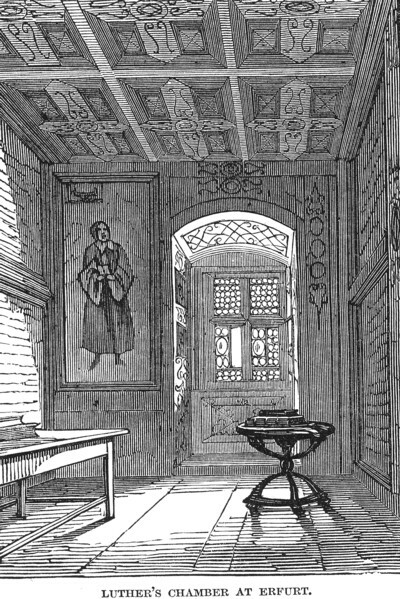 A view of the interior of the chamber which Luther occupied in the old Augustine Convent at Erfurt. While at the University here, Luther appears to have led a careless life; but, in 1505, one of his fellow students was killed at his side by lightning, and Luther from that moment, made a vow to become a monk. On the 17th of July, in the same year, he entered the Augustine Convent at Erfurt, carrying with him only a Virgil and a Plautus. In the retirement of this convent, Luther was tormented by temptations, and religious scruples and doubts, which he has pathetically described; especially on the subject of faith and salvation, until he at last adopted the principles of St. Augustin, or at least those ascribed to that Father on grace and predestination. The second memorial is a ruined house in the village of Neuenheim, in the environs of the town of Heidelberg, in the Grand-duchy of Baden. This dwelling was formerly part of a monastery, the farm-buildings of which may also be traced in the neighbourhood. 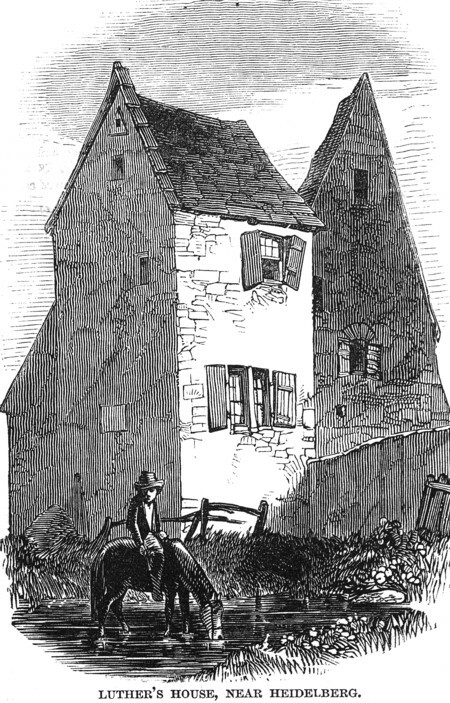 "The house" is little more than a cottage; but it is remarkable as the place of Luther's concealment for several months, after he had quitted the Diet at Worms, convoked in the year 1521, by the Emperor Charles V. The two windows of the first story are reputed to be those of the chamber wherein Luther concealed himself from the close pursuit of his persecutors. Upon the gable of a small building adjoining the cottage, may be traced the figures 1525, which are supposed to relate to the date of Luther's sojourn here.